In some situations you will need to share your printers hosted within a Microsoft Active Directory domain with users that are not members of the domain. Sometimes this creates a variety of permissions issues from Windows and Mac systems that are not a member of the domain. 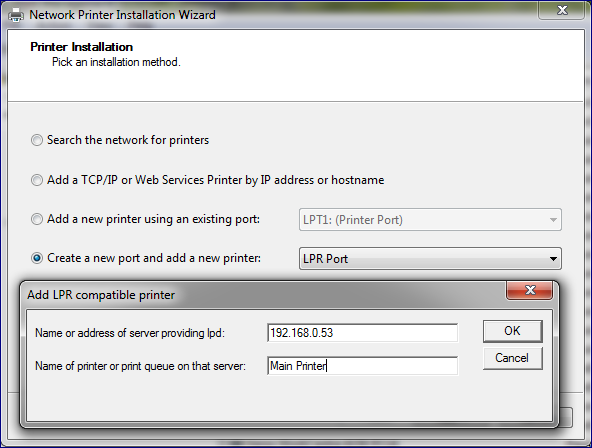 These steps provide an alternative for installing printers using the Line Printer Daemon* print service. Here is a sampling of some error conditions that often occur when attempting to use a shared resource within a domain, from a system outside of that domain. Here is a sampling of a common error condition when using Mac OSX Workstations. The first step in allowing printing is to enable the LPD service within Windows, This varies slightly between operating system. The below steps specifically apply to Windows Server 2008 R2. If firewalls, or any other TCP/IP Port Blocking software or hardware is in place, you will need to open port 515 to allow printing to the LPD Service. On Windows Server 2003 and Windows XP, the LPD Service is installed by installing "Print Services for Unix." These settings also vary from system to system. A brief summary is provided below. 1. Open that Add Printer Wizard, and choose to add a Local Printer. 2. When choosing a Printer Port, choose Create a New Port and then choose LPR Port. Provide the hostname or IP Address. Often its recommended to provide the IP Address of the Print Server as machines not joined to the domain may not always be using adequate DNS servers to locate the print servers. Specify the Name of the printer within the Printers & Faxes folder on your Print Server. 3. From there, choose the correct driver for your printer and complete the installation. Through the LPD is one of the easiest ways to install a Windows shared printer from Mac. Here are the basic steps. 1. Open System Preferences and locate your Print & Fax program. 2. Click the + (Plus) to add a new printer. 3. 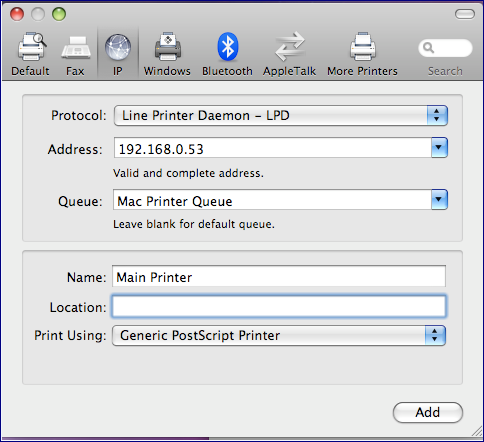 Within the Add Printer dialog, choose the type of printer to be IP and the protocol to be "Line Printer Daemon - LPD." Provide the hostname or IP Address. Often its recommended to provide the IP Address of the Print Server as a machines not joined to the domain may not always be using adequate DNS servers to locate the print servers. Specify the Name of the Printer & Faxes folder on your Print Server. The name of the printer as you will see it in Applications on your Mac. This is where you specify the driver you would like to use. If your driver is not listed, you may need to obtain this from your printer's manufacturer. While the above steps allow you to easily print to a print server and bypass multi-platform security, but you may find yourselves needing to now find a way to: (A) Know who is printing and (B) re-secure that printing you just opened up. To accomplish this, the Print Manager Plus Client Billing & Authentication add-on can be used to prompt users running windows or Mac in this manner to provide valid Active Directory credentials for their printing. It also allows for all of the restriction and tracking to occur as if that user was logged in and printing from a system within the domain. Easy to install with Mac OS X and intergrates well with Apple Active Directory Plugins. Allows Easy printing from 32 Bit workstations using 32 bit drivers to 64 bit print servers. Allows a user to install a printer as a "Local Device" even though it will be printing through the print servers. This is useful when special applications or older DOS applications will only use and print to Local Devices.